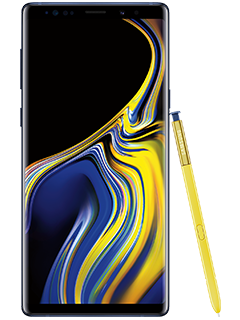 Learn how to get $790 in credits when you buy a second Samsung Galaxy Note 9. See offer details. Stay charged all day with the largest battery1 in a Note, ever. Store more and delete less with your choice of 128GB and 512GB2 models. At 6.4", the Galaxy Note9 has the largest screen of any Galaxy phone. Unleash your creativity with the all-new S Pen. Capture shots, scroll, play music, and stop/start recording video. When you buy both on AT&T Next® with eligible wireless (min. $80/mo. combined after discount). Ltd time. Each req's min. $790 on installment. Req's new line. Free after credits over 30 months. Credits start w/in 3 bills. If svc cancelled, device balance due. $30 Activation, add'l fees, taxes, other charges, & restr's apply. See offer details. SAMSUNG BOGO OFFER: Limited time. Requires one new line. Buy a Samsung Galaxy S8 Active, S9, S9+, or Note9 (priced up to $1250) on 0% APR AT&T Next (30 mos. at up to $41.67/mo.) or AT&T Next Every Year (24 mos. at up to $52.09/mo.) installment agreement and get up to $790 in credits toward the purchase of another of those Galaxy smartphones. Discounted device will be the lowest priced device. Tax on full retail price of both due at sale. Retail price is divided into monthly installments. After all credits, get Galaxy S9 for free. Credits may be applied towards Galaxy S8 Active, S9+ or Note9, which are discounted but not free. Req'd Wireless: Requires one new line. Postpaid wireless voice & data on both devices (min. $80/mo. combined if new with autopay and paperless bill discount. Pay $100/mo. until discount starts w/in 2 bills. Existing customers can add to current plans). If you cancel wireless on one, will owe that device balance of up to $1250. Activation/Upgrade Fee: $30 each. Return: w/in 14 days. Restocking fee up to $45 each may apply. Add'l BOGO terms for customers w/consumer acct & Subscriber Paid User acct: Buy one device must be on Subscriber Paid User acct & free/discounted device must be on the consumer acct. Billing addresses for Subscriber Paid User & consumer accts must match. Req's elig. postpaid wireless voice & data svc on both devices. Combined min. elig wireless svc is $73.50/mo. ($28.50/mo. on Subscriber Paid User acct + $45/mo. on consumer acct after autopay & paperless bill discount. Pay $83.50/mo. until consumer acct discount starts w/in 2 bills.). Bill Credits: Credits start w/in 3 bills. Applied in equal amounts to device over entire agmt term and will not exceed the lower of the device cost or max credit of $790. Both wireless lines must be on same acct, be on an installment agreement, active & in good standing for 30 days to qualify. Installment agmts start when device is shipped. To get all credits, free/discounted device must remain on agmt for entire term and you must keep eligible service on both devices for entire installment term of free/discounted device. If you cancel service on either line, credits will stop. If you upgrade or pay up/off agmt on free/discounted device early your credits may cease. Limits: See your sales rep before any purchases to determine if eligible. May not be combined w/certain other offers, discounts or credits. Purchase, financing & other limits & restr's apply. This offer may make your wireless account ineligible for select other offers (including select bill credit offers) for a 12-month period. GEN. WIRELESS SVC: Subj. to Wireless Customer Agmt (att.com/wca). Credit approval required. Svcs not for resale. Deposit/Down payment: May apply. Limits: Purch. & line limits apply. Prices may vary by location. Taxes, fees, monthly, other charges, usage, speed, coverage & other restr's apply per line. See att.com/additionalcharges for details on fees & charges. Pricing, promotions, programming, terms & restr's subject to change & may be modified or terminated at any time without notice. International and domestic off-net data may be at 2G speeds. AT&T service is subject to AT&T network management policies. See att.com/broadbandinfo for details.